The Noble Shaykh Mis'ad al-Hussayni (May Allaah Preserve Him), Professor of Tafseer (Quranic Exegesis) and Quranic Sciences in The Islaamic University of Madinah, K.S.A., delivered a LIVE tele-link lecture concerning the important affair of remaining steadfast in the non-muslim lands. 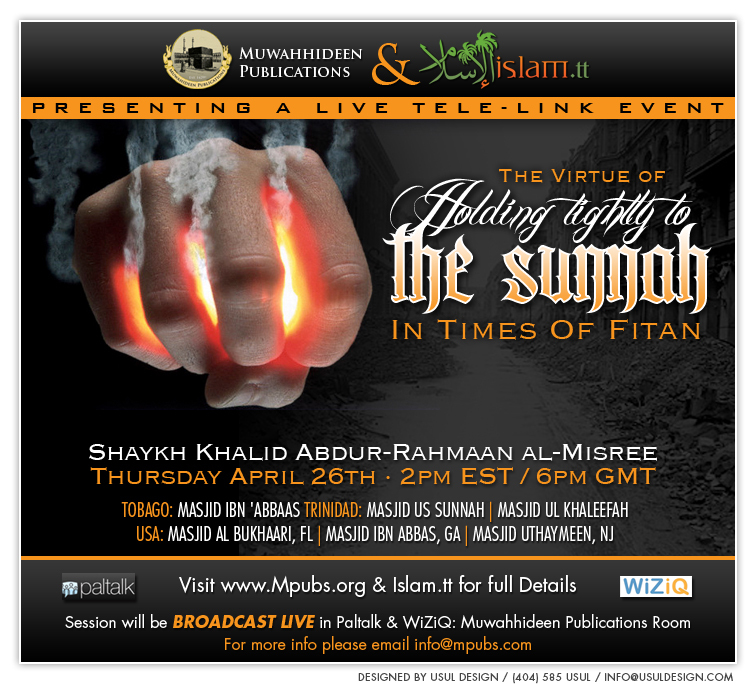 This tele-link event was broadcast LIVE in Masjid Ibn 'Abbaas, Tobago, two masaajid in Trinidad, Masjid ul Khaleefah and Masjid us Sunnah, and two masaajid in the US Masjid Al-Bukhaari, Florida, and Masjid Ibn 'Abbas, Georgia. The Noble Shaykh Mis'ad al-Hussayni (May Allaah Preserve Him), Professor of Tafseer (Quranic Exegesis) and Quranic Sciences in The Islaamic University of Madinah, K.S.A., will deliver a LIVE tele-link lecture concerning the important affair of remaining steadfast in the non-muslim lands. This tele-link event will be broadcast LIVE in Masjid Ibn 'Abbaas, Tobago, two masaajid in Trinidad, Masjid ul Khaleefah and Masjid us Sunnah, and Masjid Al-Bukhaari, Florida. It will be translated LIVE into English. The Noble Shaykh Maher ibn Dhafer al-Qahtani (May Allaah Preserve Him) will deliver a LIVE Telelink lecture to the brothers and sisters at Masjid Ibn 'Abbaas, Crown Point, Tobago for the weekend seminar "The Journey of Death", on the issue of remembering death. Our noble Ustadh (Teacher), Abu Khadeejah Abdul-Wahid 'Alam (May Allaah preserve him) from Salafi Publications in Birmingham delivered some very beautiful advices to our sisters, on two of his visits here to Trinidad & Tobago. Once in February 2011 after the seminar "Establishing An Upright Community" in Tobago and again in March 2012 after the seminar "The Methodology of The Men Who Changed The World"
More info on Muwahhideen Recordings coming soon insha'Allaah. Have you visited Masjid Ibn 'Abbaas in Tobago? Website coming soon.